Isn't the blogging atmosphere great? Not only do you get to hear so many wonderful stories from real people - - you can make great friends from all over the world! Who here is a fan of healthy eating and also staying positive & bubbly? I know I am. That's why I want to introduce to you today Angie from Dishes Undressed! An enthusiastic cook from the UK bursting with personality, I am thrilled to have Angie talk to you about her inspirations. Over to you, love! A big hello to everyone, all the way from England! I’m Angie and I hope you’re having a great day! Today I’m honoured and excited to be guest posting for Cathy. I met Cathy in the ‘blog-o-sphere’ recently and fell in love with her inspiring journey on Cathy Trails. I just loved the vibe here so much and it brings a happy heart beat every time I visit! 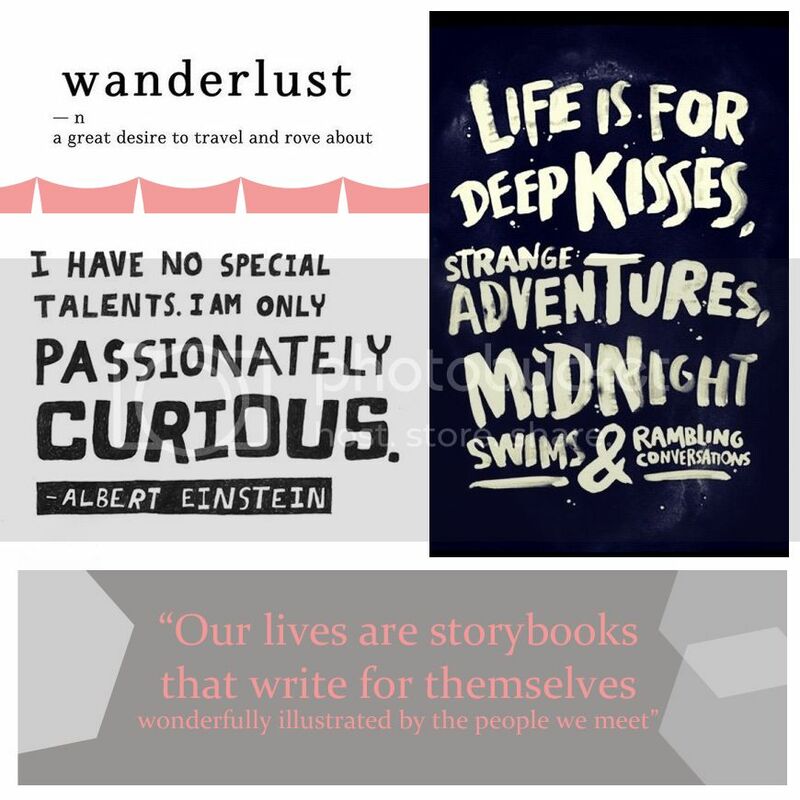 Today I’ve come by Cathy Trails to share with you some of my favorite inspiring quotes and images (with a travelling theme) - which I also know Cathy is a fan of! Do you love to travel too? Because I love food (and especially eating fresh, healthy food) the first picture here is some good points to remember about food. I carry a notebook with me all the time and write down lots of things I see, hear or eat. 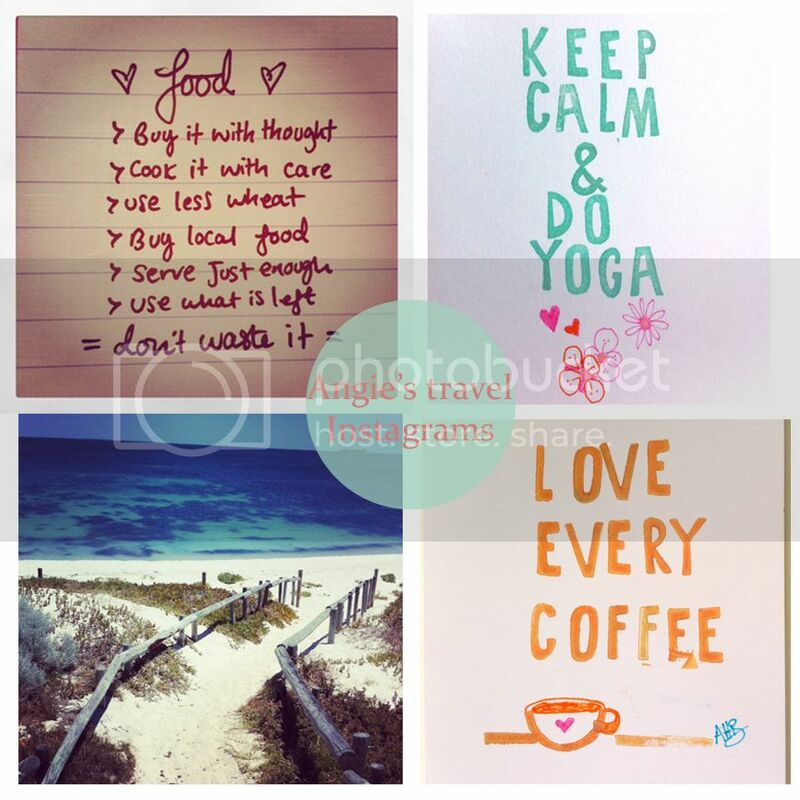 I then take a photo and Instagram it – got to love Instagram, right! The next image is a little picture I designed – I am a huge yoga fan and wherever I am in the world, I take my mat with me and have to yogaise. Without yoga, I get pretty lost and bummed. If you haven’t already tried yoga, please do, it will change your life. The beach shot is the last photo I took of my favourite beach in Western Australia the day I left to return back to the UK. The colours really are that vibrant in WA, there is practically no editing on this picture and it’s a beautiful happy memory. The next little picture is another one I made (I love stamping, doodling and drawing!) because one of my other loves is… yes, you’ve got it, coffee!! My favourite place to be is sitting in a favourite café, drinking a good coffee, with wonderful company. I could be anywhere in the world. Even if I sit by myself I enjoy watching the people and world around me. My love affair with food came from my travels too – trying new food from new cultures really opened my mind and taste for flavour combinations using herbs and spices, fresh fruit and vegetables. Great food with great company makes for a happy heartbeat. What makes your happy heart beat? Do you have a travel fantasy, or do you love to share good coffee and conversation? Where would you be if you could close your eyes and magic yourself there right now? Thanks for having me visit your blog today Cathy - and her lovely readers! I hope to see you soon for more adventures! Nice guest post! Love your instagrams. Angie is so awesome, really saved me this week! The blogging community is one of the best ways to meet new people. Everyone is so nice and supportive of each other. It really is :) I feel the exact same way. The blogging community is pretty cool...my family and traveling makes me happy! wow I love her upbeat attitude. Thanks for introducing us to such a great fellow bloggee Cathy! She's great, huh? You are welcome Tara! Love your post..very positive..following you on bloglovin"
I love her upbeat attitude! She's great! Whoa Rhi! You live near a beach like that?!?! Jealous! !